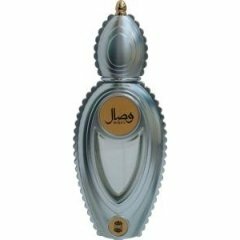 Wisal is a popular perfume by Ajmal for women and was released in 2010. The scent is floral-oriental. The longevity is above-average. It is still in production. Wisal von Ajmal was another cheap blind buy from me. I bought a full 50 ml bottle and carton from a private supplier for little money. If I hadn't liked it, it wouldn't be much spanking. Wisal lives in a kitschy-silver bottle and is a lush oriental-spicy rose scent. It starts with a light peppery note and immediately turns into a dark spiciness. This spiciness is combined with dark red velvety roses. Oud is certainly also indoors (albeit artificial), which gives the fragrance a slight smokiness, but rather subtle. I don't like it too smoky anyway. This is complemented by slightly woody bonds. I can't see any other flowers. It finishes with a subtle musky note that is very pleasant. It has a very warm and spicy radiance, oriental just. Durability and sillage are very good and almost too much in midsummer. Now in September it is better wearable. He might like people who also like Yves Rochers`Rose Oud. I have certainly not regretted the purchase. Wisal is a wonderful blend of roses, spices and woods. Opens with a beautiful floral bouquet with some tiny musk note and then develops to a fresh and sweet roses heart with a touch of spices. The opening notes may smell a little medicinal to someone, maybe there's an oud note there, despite not listed. The base is woody and has some hints of musk. The rose is still there, fresh and sweet in the right amount to my nose. Wisal is a wonderful floral fragrance that's unissex in my opinion. Wisal remembers me of many Montale fragrances, specially Aoud Amber Rose. In the drydown it reminds me of Micallef Aoud Rose, but Wisal is heavier and less sweet. Definately a great choice. Niche level for sure. Sillage, projection and lasting power are great - it lasts around 8/10 hours easily with a good projection.